Continuous Improvement Culture: continuous effort to improve organizational climate as well as the productivity of the core business in response to continuous changes in the marketplace. 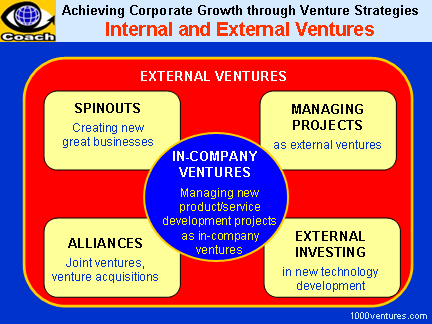 Durable Corporate Venture Strategy: internal investment in innovation, new product/service development, and in-company ventures, new business creation though spinouts, and external venture investing in new technologies and emerging markets. In ventures, large and midsized companies can discover a source of growth they are striving to achieve. New business creation has become central to achieving strategic and financial objectives of market champions. "Silicon Valley wouldn't exist if big companies couldn't identify technology and market opportunities and move with speed to capitalize on them", says Mike Moritz of Sequoia Capital Partners. Most companies possess a wealth of attractive opportunities. Most of these usually remain undiscovered, with only a few ever brought to attention, and in the best cases only a few ever brought to attention, and in the best case only one or two actually pursued. Today, spinouts, a new form of creating and financing a high-tech company are very popular. This novel approach has a number of advantages over a merger or acquisition and it plays an increasingly high role for high-tech companies. A spinout enterprise differs from a spin-off. Spinouts remain closely tied to the company that developed them. In most cases, the ties are both financial and operational. Financial ties can be enforced through interlocking of stock ownership and financial oversight by the parent company. Operational ties may include shared professional and administrative services as well as marketing and leadership support. More and more companies are turning to project financing through spinouts. In this arrangement, loan repayments are based on profits realized from the project. Jack Welch, the legendary former CEO of GE, believed in surprise move, the bold play, and shocking his rivals. "He loved the idea that he could shake things up while others looked on from the sidelines, sitting idly by while he knocked his competitors for a loop," writes Robert Slater. "This was what Jack Welch had in mind when he began reshaping General Electric. It's what he had in mind when he began thinking about his conquest of RCA. Acquiring RCA was a revolutionary move for General Electric. Throughout most of its history, GE grown from within. It simply did not believe in growing by acquisition."